The birth anniversary of Bharat Ratna Dr Babasaheb Ambedkar was celebrated with great enthusiasm in Nashik. The songs praising Dr Ambedkar, the followers of Dr Ambedkar along with the , beats of drums dancing to the tune of the music, splash of blue colour and the bursting of fire-crackers were the main highlights of the procession taken out on the occasion. In the beginning, district guardian minister Chhagan Bhujbal garlanded the statue of Dr Ambedkar at Motha Rajwada in Old Nashik area. Later, Bhujbal and mayor Adv Yatin Wagh broke coconuts and the procession began. Beginning from Motha Rajwada area, as many as 22 tableaus participated in the procession. The participant mandals had used electric lighting, flex boards on large scale to decorate the tableaus. Bheemshakti Mitra Mandal, Mukti Bhoomi enacted a scene from Dr Ambedkar’s life, Yeola was the main attraction of the procession. There was attractive lighting by Rahul Mitra Mandal . Modern music along with lighting presented by Samrat Social Group was the attraction for children as well as elders. Shiv Sena tableau were also there in the procession. Nationalist Congress Social Foundation and Chowk Mandai Birbal Akhada were welcoming presidents of all participant mandals at Vakdi Barav. MLA Vasant Gite, corporators Sanjay Chavan, Sanjay Sable, Sunil Bagul, Ramsingh Bavri, Anand Sonawane, Bhadrakali police station senior PI Ramesh Patil and office-bearers, activists of various mandals and citizens participated in the procession. 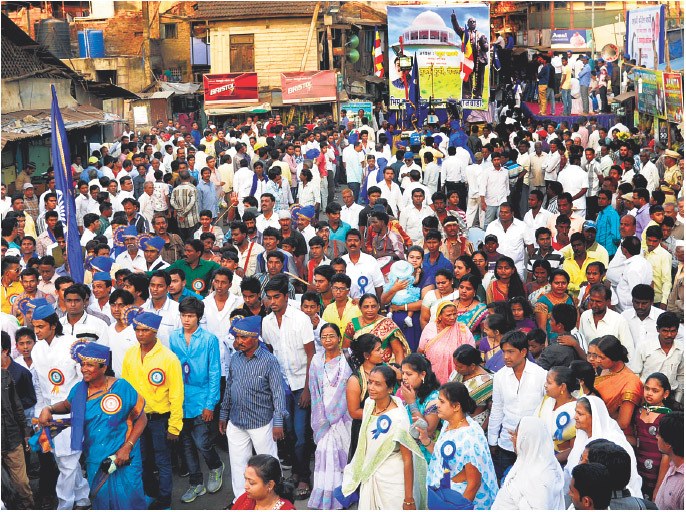 The birth anniversary of Dr Ambedkar was celebrated in Nashik Road, Deolali, Satpur and CIDCO areas of the city also. Huge processions were part of the celebrations in these areas.